Pasadena’s All Saints Church has long held a reputation for being one of the most progressive and activist churches in the nation when it comes to helping the poor, especially at Christmastime. But even leaders of this über-generous house of worship didn’t expect the huge response they received from concerned community members following a special sermon by Rector Ed Bacon on Dec. 12. The results were overwhelming, with more than 500 coats being donated from parishioners alone — and hundreds more coming in from other parts of the community. 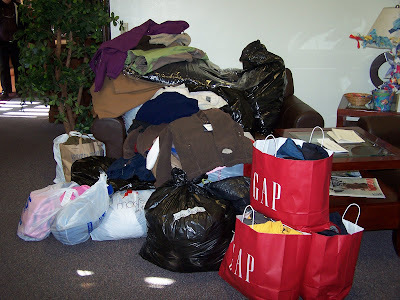 The coats will be delivered to the Dolores Mission, run by Catholic priest Father Greg Boyle, as well as the Ecumenical Council Pasadena Area Churches (ECPAC) Bad Weather Shelter, ECPAC’s Women’s Room program and to Families in Transition for homeless families in the Pasadena Unified School District. The breach between conservative and liberal Episcopalians widened as a lesbian was elected an assistant bishop in Los Angeles, drawing fire from Anglicans world-wide. The Rev. Canon Mary D. Glasspool, 55 years old, was elected late Saturday on a seventh ballot, after several votes ended in deadlocks. Open about her sexual orientation since her seminary days, Canon Glasspool has been with the woman she calls her life partner since 1988. She is in line to become the second openly gay bishop in the Episcopal Church, after the Right Rev. V. Gene Robinson, who took office in New Hampshire in 2004. The Episcopal Church, with about two million members, is the U.S. branch of the world-wide Anglican Communion, which has about 80 million members. Bishop Robinson's election raised tensions between the U.S. church and its counterparts around the world, especially in Africa and South America, where church leaders expressed concern that the Americans were pursuing a liberal social agenda in defiance of traditional Christian teachings on homosexuality. To try to hold the communion together, the Episcopal Church agreed to stop ordaining gay bishops. But at its national convention last summer, the church voted to reverse that ban, leading to Canon Glasspool's election. Rowan Williams, the Archbishop of Canterbury and head of the world-wide Anglican communion, issued a statement saying Canon Glasspool's election "raises very serious questions" about the Episcopal Church's role in the Anglican Communion. He called on American Episcopalians to refrain from provocative acts. Maintaining a "period of gracious restraint," he said, is vital "if our bonds of mutual affection are to hold." His concern was echoed by Father John Spencer, vicar general of a diocese in Quincy, Ill., that refuses to recognize the authority of the U.S. Episcopal Church because of its stance on issues such as the ordination of gays. That diocese is one of several in the U.S. that have broken away from the national Episcopal church and aligned instead with more conservative Anglican provinces overseas. Father Spencer said the American Episcopal leadership seems bent on making political statements "rather than pursuing Christian unity with the rest of the church." It is unclear whether the communion would support a move to expel the Episcopal Church. An expulsion would require approval from two-thirds of the Anglican communion's roughly three dozen provinces world-wide. Bishop Robinson, the first openly gay bishop, said in an interview that he doubted conservative critics could muster that two-thirds majority. "Asian and African bishops have said to me, 'Look, we don't agree with you on this issue. We don't ordain gays. But we're worried about people dying of AIDS, malaria and abject poverty and this comes way down on our list of priorities,'" he said. "It's not a communion-breaker." Some Americans believe that if the communion does attempt to expel American Episcopalians, it is a price worth paying, said the Rev. Ed Bacon, rector of All Saints Church, a Episcopal congregation in Pasadena, Calif. "I'm sure there will be people who will call for the American church to have second-class status or even not to be admitted to the communion," he said. "But the American church is willing to take whatever consequences may come in order to save its soul, which means boldly and consistently advocating for justice for all." Bishop-elect Glasspool is intimately familiar with the deep divides in the church over the role of women and gays. Her late father was an Episcopal priest who didn't believe that women should be ordained, Canon Glasspool wrote in her application for the post of bishop suffragan, or assistant bishop, in Los Angeles. She also described years of intense struggle as a young woman as she sought to reconcile her faith and her sexuality. She finally came, she wrote, to understand "the integrity of responding to God's call with your whole person, being exactly who you are." She was traveling Sunday and unavailable for comment. A day before Canon Glasspool's election, clergy and lay delegates to the Los Angeles diocesan convention elevated another female priest, the Rev. Canon Diane Bruce, 53, to another open position as assistant bishop. She and Canon Glasspool will become the first two female bishops in the diocese's 114-year history. Their elections must still be confirmed by a majority of dioceses within the Episcopal Church. If this happens, as is expected, they will be ordained in May.